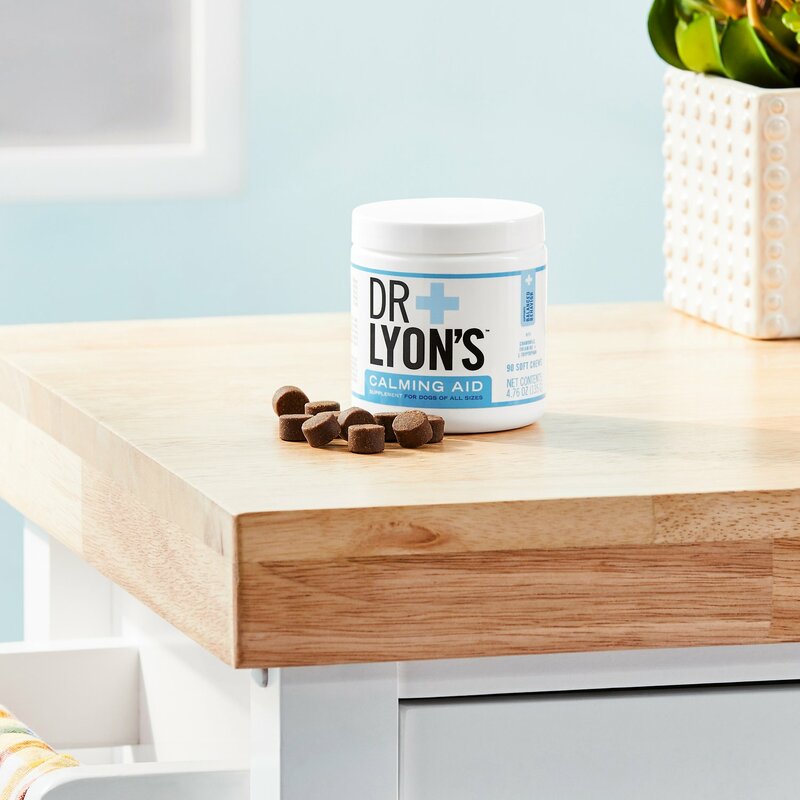 Help keep your dog calm in times of potential stress with Dr. Lyon’s Calming Aid Soft Chews Dog Supplement. Guided by science and inspired by nature, they’re formulated with key nutrients and herbal extracts chosen for their calming properties, including chamomile flowers, ginger root extract, vitamin B1, l-taurine and l-tryptophan—a natural amino acid that may help promote relaxation. This targeted blend of active ingredients helps promote balanced mood and calm behaviors in possibly stressful situations for your dog, including during thunderstorms, grooming or traveling. 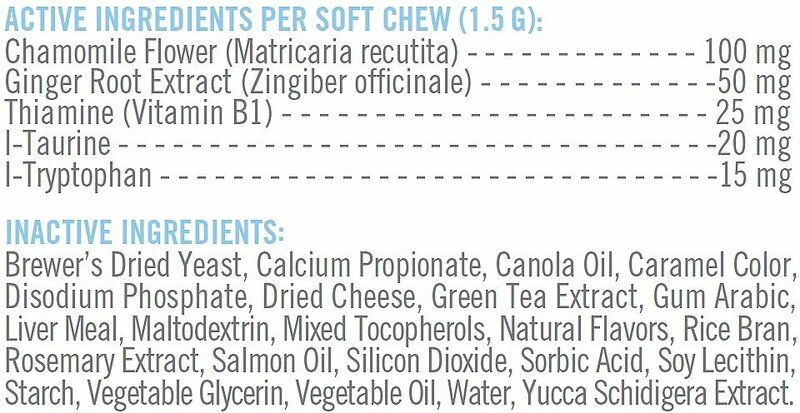 Plus, these soft chews are naturally flavored with cheese and liver so they’re a delicious treat you can give your pup to help with occasional stress. Helps temporarily promote balanced mood and calm behavior in dogs when used during possibly stressful situations. Formulated with chamomile that’s known for its soothing properties, plus ginger extract and key calming nutrients including vitamin B1, l-taurine and l-tryptophan. Vitamin B1 is added to help promote stress relief and l-tryptophan is a naturally occurring amino acid linked to relaxation. Ideal for times of potential stress like during thunderstorms, boarding or grooming, when going to the vet or traveling, as well as when meeting new people. Naturally flavored with cheese and liver so they’re a supplement dogs can actually enjoy; give as needed according to your dog’s weight. Warnings: For animal use only. Keep out of reach of children and animals. In case of accidental overdose, contact a health professional immediately. Do not use if product appears to be tampered with or seal is broken. Store product in cool, dry place. Avoid temperatures above 86°F. Cautions: Safe use in pregnant animals or animals intended for breeding has not been proven. Do not use in pregnant animals. An examination from a veterinarian is recommended prior to using this product. Do not use in dogs that have heart problems. Do not use this product prior to anesthesia or prior to surgery. Make sure your dog has plenty of fresh drinking water when using this product. Brewers Dried Yeast, Calcium Propionate, Canola Oil, Caramel Color, Disodium Phosphate, Dried Cheese, Green Tea Extract, Gum Arabic, Liver Meal, Maltodextrin, Mixed Tocopherols, Natural Flavors, Rice Bran, Rosemary Extract, Salmon Oil, Silicon Dioxide, Sorbic Acid, Soy Lecithin, Starch, Vegetable Glycerin, Vegetable Oil, Water, Yucca Schidigera Extract. Give to your pet 30 minutes prior to a potentially stressful situation. For maximum effect, give to your pet daily for 7-14 days. Natural plant extracts and specially selected nutrients provide balanced mood support for dogs when encountering potentially stressful conditions. Each soft chew is infused with chamomile flowers to provide gentle relaxation, along with ginger root extract plus vitamin B1 and l-tryptophan—a natural amino acid with calming properties. Give them in times of possible stress for your dog, including traveling, boarding or grooming. My fiancé and I rescued a corgi-papillon in the beginning of February and she’s a highly energetic barking dog. We wanted something to calm her down a bit and get her to focus when training. These have no effect on her...the times I gave them to her about a hour before her training class she spent the entire hour barking at people/noises/absolutely nothing. She squeal barks too since she is so wound up and scared at training. I wouldn’t buy them again, sadly nothing I’ve tried has worked so far with her. This calming aid works well. I've given it in the past in anticipation of a stressful event, but it was difficult to know the degree that it helped. Today, there was construction in my building that I was unaware of, and after listening to my dog bark for 2 hours I gave this to her and hoped it would work. Within 30 minutes, she was laying down and had stopped barking. It's good to know you don't always have to anticipate the need to use these and they work as described. I decided to try these when Chewy had a special on them. They really seem to work well for my pack. They have a strong smell that makes my dogs eager to eat. So far I have used these for storms, vet and when I am entertaining. It seems to chill my dogs out just enough.My anxious/nervous boy will go and find a place to sleep. I plan to keep these in stock! I recommend giving these a try for your anxious pet. I have only used them once when we had a thunder storm but it did calm my four fur babies down & they loved it & wanted more..I am waiting til the 4th of July & hope it will do the trick which I think it will. Unfortunately this product is not my dog’s favorite. Unfortunately my dog will not consume this product no matter how I try to get him to eat it, ie, whole, crushing or even in wet food. He is a hypo-active breed and I looking for something in a jerky style with flavor that he will consume. These work well for us! My toy poodle is totally frantic and goes nuts when there are thunderstorms, and if I can get to her ahead of time and give her one of these (1/2 hour or so in advance), it definitely helps her! People are unrealistic if they think it will provide a completely calm dog (come on people!) but what it does is help lessen the usual extreme reaction. Which is a win in my book! Definitely will purchase again! I purchased this product after seeing how calm one of my daughter’s dogs was after taking it. She is a rescue and terrified of everyone but my daughter. She was a different dog, she let me approach her and pet her without that sad terrified look. It was amazing to see the difference so I purchased some for my lab who is terrified of storms. i was "gifted" a sweet 6 year old cockapoo by one of my children. incessant barker. this product has not done a thing to settle him. still just working with him to control his barking. Product arrived quickly. Ordered it to see if it could calm my dog down during grooming. Have given it to him two times. Increased the dosage the second time. Can’t really tell that it did much. Don’t know that I’d recommend this item. My dog seemed to like the taste just fine ,but it didn’t really seem to have much effect on him.